Item # 283844 Stash Points: 1,999 (?) This is the number of points you get in The Zumiez Stash for purchasing this item. Stash points are redeemable for exclusive rewards only available to Zumiez Stash members. To redeem your points check out the rewards catalog on thestash.zumiez.com. 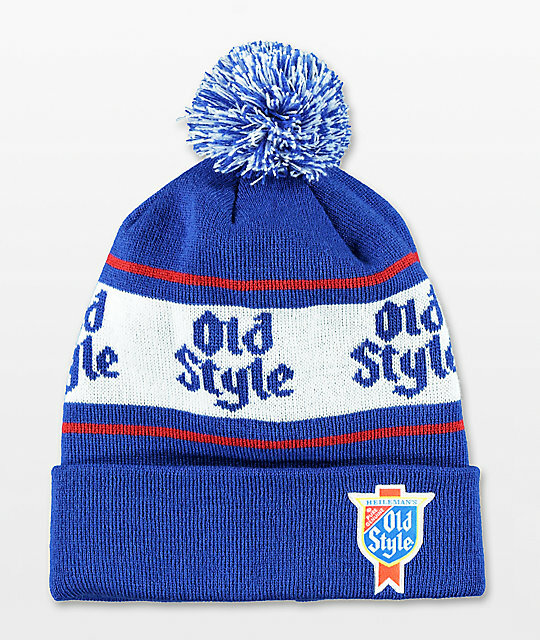 Get a style that you can drink right up with the Old Style blue and white pom beanie from Spacecraft. The crown is adorned with jacquard knit "Old Style" graphics and topped off with a blue and white pom pom while the fold-over cuff is adorned with a classic "Old Style" logo patch. Old Style Blue & White Pom Beanie from Spacecraft. Jacquard knit logo graphics on the crown. Blue and white pom pom on top. Embroidered brand patch on the fold-over cuff.